Koowheel Hovershoes Review - Insane New Hover Skates For All Ages! Hover shoes came on the market in 2018, and are set to be one of the hottest rideable gadgets for all ages. In case you don’t know what they are, basically they’re a cross between a hoverboard and electric roller skates – they’re not a “shoe” per se though as you stand ON them rather than put your foot INTO them. 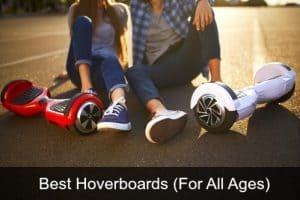 They’re proving to be a whole lot of fun for all ages, and you might even find these to be an upgrade to the electric hoverboard that has been so popular in recent years even though they use similar self balancing technology. 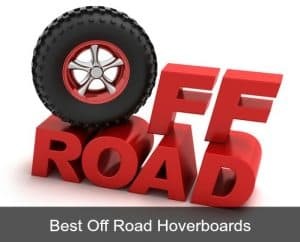 In this article we’re going to take a look at one of the best known brands, Koowheel Hovershoes (also known as hover skates). Koowheel are one of the biggest manufacturers of consumer electronics including electric bikes, electric scooters, electric longboards and other rideables. So its not surprising that they’re one of the first to bring the next “big thing”, hovershoes, to the market! These are basically two separate self-balancing hoverboards with 250w dual motors featuring in-built gravity sensors that combine the fun of a typical skateboard and the self balancing scooter. Hovershoes vs hoverboards – how do they compare? 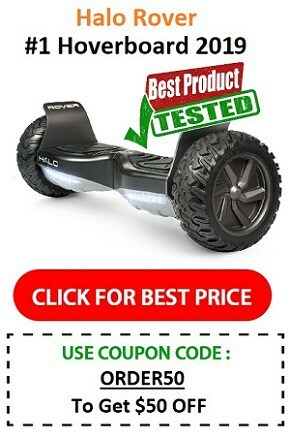 Firstly, like the self balancing scooter we know as an electric hoverboard, you don’t technically “hover” – you stand on a board with wheels which “glides” rather than hovers off the ground. The name has probably been derived from the fact that this technology give the wearer a floating feel without having to move their legs. They both use similar self balancing technology which makes them easy to use for even the youngest of riders (they’re suitable from about the age of 5 years to adult). Unlike the electric hoverboard (which is just one board), these are two separate balancing one wheel boards (one foot is placed on each) that work in a similar way. This gives you more freedom of movement so you can try new skills and tricks that aren’t possible on more traditional smart self-balancing scooters. Right now hovershoes are a new and pretty revolutionary rideable that many people haven’t even seen yet. Hover shoes are more portable than an electric scooter or similar rideable because they’re lighter and you can carry one in each hand. Also they’re small enough to fit in a backpack. Hover shoe features – how do they work? These hover skates comes in black with red accents. Each shoe weighs about 3.3 kg and has a joint maximum load capacity of 286lbs. Each shoe has a 250W dual motor and is equipped with a 54wh battery that takes approximately 1.5 hours to full charge. As you can see the charge time is pretty quick which is good. The balancing one wheel shoes work within the temperature range of 0° to 40°c. The maximum gradient for is 9° which means that they’re really only suited to relatively flat ground. Each wheel has a tire diameter measuring 3.5 inches. They can attain a max speed of 12 km/h and allow the wearer to drive a maximum of 10 km on each charge. The recommended charging input is AC 100-200V. 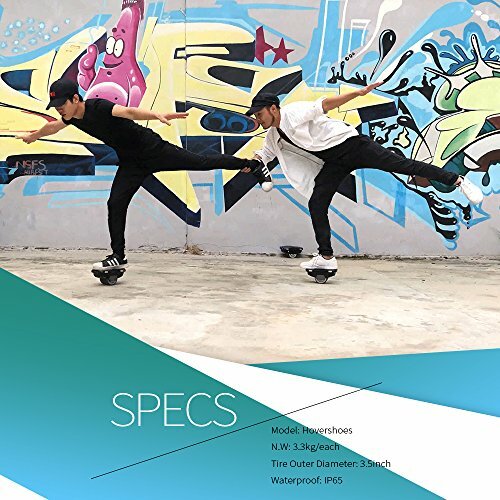 Each shoe has a water resistant design (this does NOT mean they are waterproof – they’re not suitable for riding through puddles or in rain) with dimensions of 5.3 x 4.5 x 8.8 inches. Lithium Polymer batteries are required for the shoes to function. In the box you get a pair of Hovershoes, a power charger, a storage bag and a user manual. They are extremely well-built and sport four handles (two each) for carrying purposes. Because they’re light and you can carry one in each hand they’re much more portable than a hoverboard which can be heavy and awkward, especially for younger users. The wheels are all-metal which ensure unmatched durability. Each shoe is lined with LED’s that turn green or red depending on the wearer’s movement status, the “Hovershoes” name on the side and the logo on top. They come with standard 1 year warranty covering any manufacturing defects. Koowheel are a US based company which means quick response and service, usually within 24 hours. They claim to test all parts individually and run every pair for 250 minutes before delivery. The Koowheel Hovershoes can be used by any person, adult or child. They’re suitable for most children from the age of 5 (they’re pretty easy to operate) and any adult with max weight of up to 286lbs. MOST people manage to master these within 5 – 30 minutes as they’re easy to learn and use. IP65 water resistant (that means they’re splash proof rather than waterproof) – it’s still not recommended you ride when raining or through puddles. They’re a great alternative to any of the current rideables on the market if you’re looking for something new to try. Can be used by people of all ages – EVERYONE will want a go on these. They’re so new most people will never even have seen something like this yet. 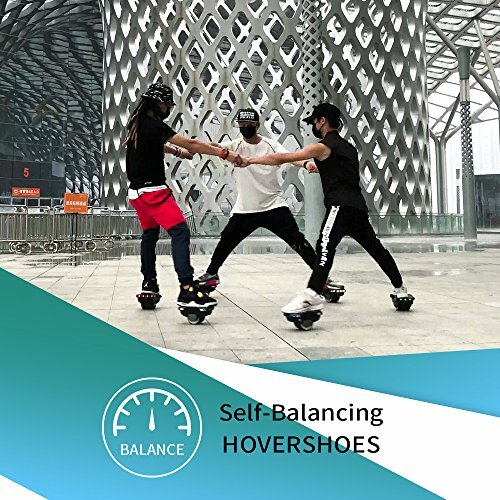 Self-balancing technology of the shoes makes it easy to balance and learn to use them (that doesn’t mean safety wear such as helmet and elbow/knee pads shouldn’t be worn – particularly important for younger riders! The narrow wheels make riding quite strenuous on the legs if you’re wearing them for a long time. Must be well-charged before use to prevent running out of juice while en-route (they charge pretty quickly though and both can be charged at the same time with the dual charger cable). Ideal for smooth surfaces, concrete and asphalt. Unsuitable for stone-paved or rugged roads. They also don’t handle mid to steep slopes well so level ground is best. 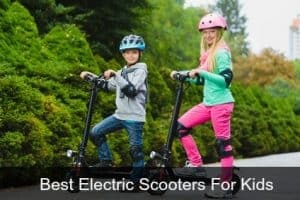 More of a gimmick than a means of daily transportation – they can be used for a short commute, but most people will probably use these for fun and opt for something like an electric scooter (which has a higher max speed and is sturdier for travel) when commuting. These are tested and found to be free from any potential fire hazards. They have passed UL2272 testing requirements which are based on the national standards for hoverboard electrical safety. First of all, no matter how excited you are to get started after unboxing, you should read the manual! Even though they’re relatively easy to operate, manufacturer advice on how to ride and use your hover shoes safely is important! Riding on the Hovershoes isn’t too difficult but does require some practice that varies from person to person. The claim that the shoes can be mastered in less than 10 to 30 minutes isn’t always true. Although they are self balancing, you do need to learn how to move backwards and forwards, master keeping balance, use the turn and stop function, and just get used to maneuvering around on them. 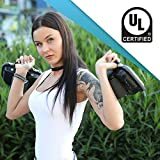 Anyone who has ridden an electric hoverboard, skateboard, electric roller skates or roller blades etc before will probably find them super easy to learn though. The best way to master these Koowheel shoes properly is to borrow a support like walker or crutch or someone’s hand during the learning period, so that even if the shoes pull your legs away from each other (and they probably will when you first get started), the external support will keep you from falling over. Anyone on any rideable should wear safety gear such as a helmet and knee/elbow pads, and this is especially important for children. We recommend hover shoes – will YOU be trying them? These electric rideables come with a price tag of $249.00. Not on the cheap side, but the shoes provide plenty of fun and are an awesome upgrade to the self balancing scooter, electric scooter, skateboard or roller skates, despite being a bit more expensive. Koowheel built these shoes with premium materials and safe UL certified batteries – these unique electric roller freeline hoverskates are built to last and deliver. It is worth mentioning that the product isn’t scratchproof, but that’s the same for most rideables. If you’re looking for something new to try that’s easy to operate (or want a gift for your kids that you KNOW will be well received) these skate type shoes are a good bang for your buck, especially seeing as there are other brands charging almost $100 more for almost the exact same product. And they’re also a gift that the whole family can enjoy. Last but certainly not least, their customer service is pretty good – if you have any issue with your product just get in touch with them and they’ll help you out. I hope you’ve found my Koowheel Hovershoes review helpful, if you’ve tried them yourself or have any questions I’d love to hear from you. Just comment in the box below.